I've got more irons in the fire than a blacksmith with a cavalry contract. Spring chores at Wilderstead are piling up on the to-do list, even as the good weather means that block-laying can resume. I went over to the holler today to continue work on the piers behind the undercroft. One more day's work, and I'll need to shoot levels to see where we are. At a minimum, the next time I go over, I need to mow trails, as well as around the cabin and the building site. My generator is ready to be picked up, too, so that'll be going out next. And I need some gravel in a couple of places. And so on and so forth. I may be slow, but I'm still making forward progress. And that's something to be thankful for. Meanwhile, I've also got a bunch of stuff going on here at home. The latest issue of The Pathfinder (our Conference Scouting ministry newsletter) has got to be put in the mail. I'm cooking for a big Cub-o-ree in a couple of weeks, so recipes, grocery lists, and shopping have to be gotten after. And the garage needs to be straightened up and some of the heavy stuff (scrap metal, old electronics) needs to be disposed of. And in my spare time (snort), I really need to walk more. The fat is clinging to me, and I can't get it to go away. As T-Bone used to say, "Such predicaments. I must forge ahead." But in the euentid of the sabat, that bigynneth to schyne in the firste dai of the woke, Marie Mawdelene cam, and another Marie, to se the sepulcre. And lo! ther was maad a greet ertheschakyng; for the aungel of the Lord cam doun fro heuene, and neiyede, and turnede awei the stoon, and sat theron. And his lokyng was as leit, and hise clothis as snowe; and for drede of hym the keperis weren afeerd, and thei weren maad as deede men. But the aungel answeride, and seide to the wymmen, Nyle ye drede, for Y woot that ye seken Jhesu, that was crucified; he is not here, for he is risun, as he seide; come ye, and se ye the place, where the Lord was leid. And go ye soone, and seie ye to his disciplis, that he is risun. And lo! he schal go bifore you in to Galilee; there ye schulen se hym. Lo! Y haue biforseid to you. And thei wenten out soone fro the biriels, with drede and greet ioye, rennynge to telle to hise disciplis. And lo! Jhesus mette hem, and seide, Heile ye. And thei neiyeden, and heelden his feet, and worschipiden him. VI. Youth Ministry: Who knew fun could be such hard work? VIII. Confirmation: catechism or cataclysm? Now that I'm retired, I think I need the spur of some deadlines to help me get this done. I would really like to have a group of friends/colleagues (clergy and lay) whom I could send chapters to, and who could then give me face-to-face feedback. These people could also tell me what things they'd like to see addressed in a book on Christian Education. (Some of those chapters might change focus, or I might need to add some. This is all provisional.) Anyway, if you'd like to be part of a reading group to help me sharpen up my stuff -- say, monthly, somewhere in central Indiana -- let me know. Over the years, I’ve done several training courses in Scouting as Ministry. Some were one-hour hot takes, and some were all-day affairs. I’ve even served as a faculty member at Philmont Training Center’s UM Scouters Workshop, which runs all week. And I’m sometimes very disappointed in how little interest I can gin up among congregations and clergy in this area. Scouting is one of our most fertile and neglected fields for making disciples. Now, Scouting ministry is just a sub-field of Christian Education/Discipleship/Spiritual Formation. The basic concepts and techniques are mostly the same. Bringing people to Christ, teaching them the faith, and preparing them for a life of discipleship is pretty much the same in or out of uniform. And I could do you as good a training course on Christian Education as I can on Scouting ministry. (In fact, my original idea of pursuing a PhD in education was in order to teach Christian Education in seminary). But surprisingly, I find as little interest in this area as in the other. Even when our District puts together training days to help people learn how to be effective in ministry, we don’t do Christian Education sessions any more. The curricula for CLM and COS don’t include much on it, either. It’s not on anybody’s radar. Maybe it’s time I took the mass of notes I’ve been working on for years and wrote that Christian Education book I keep outlining in my head. But then, given the current state of affairs in the church, who would buy it? I'm at a loss to know what to say about Notre Dame de Paris burning. I fear that the will to rebuild it as it ought to be is no longer there. So that is a loss irremediable. That said, it should remind us that everything -- no matter how solid and ancient and enduring it seems -- is fragile. All of life and all the artifacts of man and nature are precious, one-off things. Alas, like so many things, you don't appreciate it until it's gone. Fire was dreaded in the Middle Ages and a cathedral burning wasn't unknown, especially when the only source of light was fire from candles or torches. And cathedrals aren't just stone. There's a lot of hangings and wooden furnishings -- much of it very old and dry. The roofs are very old, with huge timber frames, and are covered in lead, which has a low melting point. Like a canopy fire in a forest, once the flames reach the roof, the huge, hollow structure of the Gothic cathedral acts like a giant oast. And when the fire gets hot enough, limestone will burn, too. Got a little dehydrated today. Suffering from some cramps. Deanne says I also got some sunburn. Maybe I overdid it a wee bit. But I got my gate up on the Hallows Trail (on the far side of the Pishon). 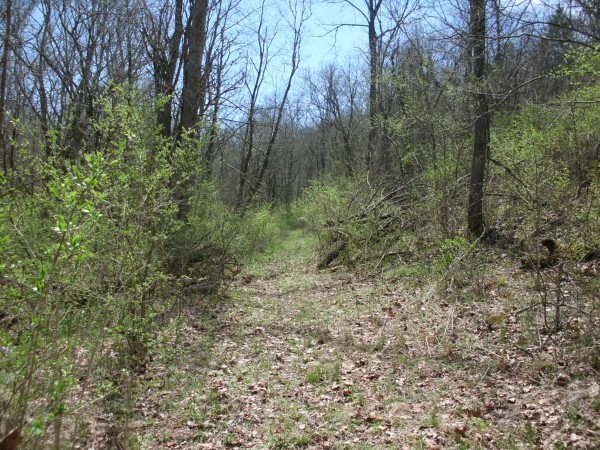 Hitherto, there have been four iron fence posts there, cutting off the trail to ATVs. 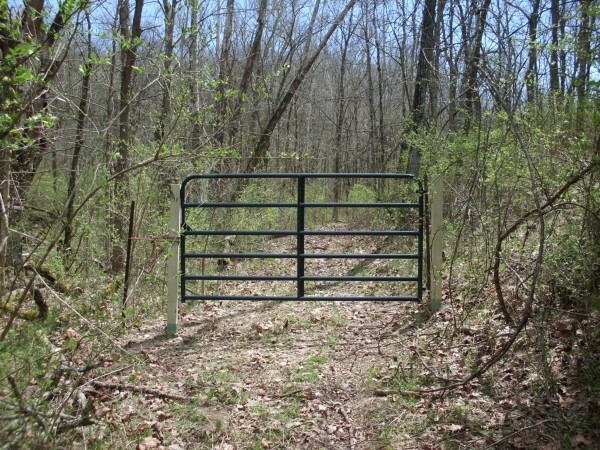 But if I ever need to get my tractor back there -- or a walk-behind bush hog, as today, then I need a gate. So I put one up first thing this morning. After getting the gate up, I drove into town and picked up the bush hog. These things will wear you out, big time. It certainly did me, today, though I was a better operator than last time. However, I haven't been on the far side of the Pishon since at least this time last year, I think. And I no sooner turned the path corner beyond the gate, than I found a big ol', multi-trunked tree fallen across the path. This necessitated a pause, wherein I fetched my chainsaw and cleared the way. Then I did some more brush cutting. I didn't do everything I might have done, but I got the trail cleared back to one of the patrol camp sites I want to maintain. 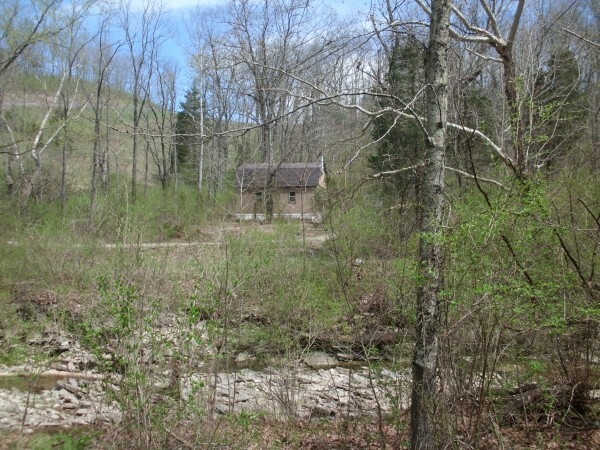 As I finished up and began schlepping everything back across the creek, I took this picture of my cabin. I don't often get a picture of it from this side of the water. I cleaned up the cabin and took the bush hog back to the rental place, then boogied for home. Got veggies roasting in the oven. It's been a good day. Though it boggles me to say it, some of my progressive colleagues are just now running the numbers and figuring out what can be made of them. But then, of course, they assumed all along that they were guaranteed to win at GC19, and were shocked beyond all measure to find out that the majority doesn't want what they want. Anyway, some of them were commenting on another's post today. They realized that if they just separated from the global UMC (mainly, Africa), then they would be a majority in the church again. (I'll dispute that "again," but they would certainly be a majority of the leadership, which is what they care about.) My response to my friend was something along the lines of frogs and ponds; that is, if you shrink the pond enough you can always be the biggest frog in it. Or as Mohammed Ali Jinnah said to the British regarding the partition of India, "I do not care how little you give me, so long as you give it to me completely." And how should I feel about that? Well, to quote William Tecumseh Sherman, when his counterpart feinted north to threaten his supply lines, "if he'll go to the Ohio, I'll give him rations." At this point, if the progs want their own denomination, they can have it, so long as they allow others to have their own, too. We are no longer voting to influence the decision to be made. Different groups have made different decisions, and they're not going to change. Furthermore, both sides insist upon acting upon their decisions. We are already effectively two (or more) denominations. The traditionalists have already offered a gracious exit to anyone who wants one, so the ball is in the progressives' court. It all comes down to how much agony the Resistance is going to make us all go through before we reach the division. We could all be grown-ups and friends about this. Or we could fight about every last asset. If the Minority wants to be a Majority for those of like mind, they have it in their power to make that happen. Go, with our blessing. And take as many bishops and bureaucrats as you can carry. This post is brought to you as a result of several conversations I've had over the last span of weeks. Several friends (and several blog posts by others) have made me chew this over and over. Please note, the problem is found everywhere: in progressive churches and in traditional churches; in mainline churches and in evangelical churches; in local churches and in denominational gatherings. What is the biggest problem with Protestant worship today? Talkiness. I mean, the blather just overwhelms you, wears you down, buries you in words. Not the Word, just . . . words. . It starts with the Announcements (as we used to sing in Scout camp, “a terrible death to die, a terrible death to die . . . “). These can go on for, well, 3-5 business days, it seems. The liturgist has a little routine he or she always does, then the pastor has to give just a few reminders, and in many congregations the floor is opened up to the laity as well. Sharing of Joys and Concerns (whether then or later) can keep the ball rolling for long enough for you to complete the Sunday crossword puzzle. Keep in mind, that not only does all this hold up the functioning parts of the service, but everything said (by everybody) is completely mystifying to newcomers, who don’t know what’s going on or who anybody is yet. Meanwhile, if there’s a worship band (God have mercy on your soul if there is), then the band leader has to share just a few reflections, as well as notes on composition, to introduce each number in their “set.” And everybody who has anything to do up front has to tell a joke, say hello, or try to warm up the crowd. The different leaders feed off each other and comment on each other’s stuff. It’s like a late night talk show. When the sermon finally comes around, it often doesn’t have a conventional starting place or ending place. Many preachers start talking about what they’re going to be talking about for some time before pausing to read any Scripture. And lots of others are still trying to make one more point when it comes time for the Benediction. And everything, sermon and prayer and announcements, is all delivered at about the same level of intensity and in the same, conversational manner. It’s like being drowned in a tank of tepid oatmeal. There are no quiet moments in Protestant worship any more. There are no pauses, no waiting for a reaction, no time to answer the question posed (assuming one was). Even where you’d expect time to process something asked of you, the response is written in for you rather than let you wrestle with it. And we’re on to the next thing. And, besides quiet, you know what else all the chatty-chat is covering up? The absence of Scripture. Which you’d think would be noticeable in a Protestant worship service, since we’re all sola Scriptura and such. But no. The Word is shared in a surprisingly sparse manner in most Protestant worship services I’ve been to in recent years. You see, “contemporary worship” has done away with "liturgy," and even “traditional worship” doesn’t have much of it left. Once upon a time, in addition to the reading of the principal text(s) of the day, the whole congregation would recite a Psalm or some other Scriptural reading. We would have a Call to Worship (which was usually a Scriptural text). We would sing little Scriptural phrases like the Gloria and Doxology. The Benediction would frequently be one of the blessings from the Bible. The hymns (remember hymns?) were often based upon bibilical texts. Even the choir and soloists would often perform works that were basically Scriptural texts. We said the words of Scripture, we sang the words of Scripture, we recited the words of Scripture, over and over to each other. And the readings were all from what we may call the English Bible tradition. We didn’t use quirky paraphrases like The Message for public reading and recitation. We may have moved on from the KJV to the RSV or the NRSV, or (depending on your denominational preferences) the NASB or NIV. But all of those versions are consciously and carefully made to be part of a long line of Biblical referencing. If you want Scripture to get down to the deepest part of the human heart, where it can pop up when you need it, then you need to be imprinting upon the mind Scripture that sounds like what we’re used to having Scripture sound like. That which wasn’t Scripture that was shared in the service were usually ancient texts based on the Scriptures, like the Apostles’ or Nicene Creeds, or the Te Deum and other early canticles. Likewise, when we celebrated holy communion, we used words that have been worn smooth by many generations of worshipers, words written by the best of us for even the worst of us. Even if we departed from the words printed in the back of the hymnal, we still followed the order, saying the things that the liturgy said. Years ago, I asked a mother of some of my youth who was raised Lutheran about how I could best bring communion to shut-ins. She replied, “as soon as you begin with the words of the service, I’m ‘there.’” Years of faithfully rehearsing the words and acts together had enabled her to receive communion even under difficult and distracting circumstances, like a hospital stay or a long, painful recovery at home. The words of the liturgy brought her back to where she needed to be spiritually, in order to meet Christ and have her need met in him. When our latest UM Book of Worship came out some years ago, it left out of the Funeral Service the old committal from the Book of Common Prayer. But you know, when you’re standing there around the grave of your loved one, and you need the right words to finish out what we’ve done, the right words to know you can leave him or her here and go back to normal life, what better words have ever been written than these? Forasmuch as the spirit of the departed hath returned to God who gave it, we therefore tenderly commit his/her body to the ground, earth to earth, ashes to ashes, dust to dust, looking for the general resurrection at the last day and the life of the world to come through our Lord Jesus Christ; at whose coming in glorious majesty the earth and the sea shall give up their dead, and the corruptible bodies of those who sleep in him shall be changed and made like unto his own glorious body, according to the mighty working whereby he is able to subdue all things unto himself. And I heard a voice from heaven, saying unto me, Blessed are the dead who die in the Lord form henceforth. Yea, saith the Spirit, that they may rest from the labors; and their works do follow them. I just dashed those down, from memory. I have said them so often. No words of mine, no sentimental poem, no made-up ceremonial, has half the effect as those magnificent words. They aren’t Scripture, but they’re better than anything that’s been written in the last half century – and they’re based upon Scripture. St. Paul said, long ago, “the kingdom of God does not consist in talk, but in power.” How strange, then, that so many Protestant churches do not connect their dwindling power with the volume of talkiness that fills their increasingly empty churches to overflowing. As the Democrats try to sort out the direction of their party and who its standard-bearer will be, all kinds of nostrums are being peddled. One of these is the idea of paying reparations for slavery. This is not the first time it's been broached, but it's being said more loudly and by more politicos today. Reparations is one of those ideas that keep coming around. In one sense, it’s the logical end of victim-centered identity politics, I suppose. It’s also about 150 years too late. There was a time when reparations would have made a lot of sense. The original freedmen – blacks born in slavery, now freed – needed a lot of help, and there’s no doubt that they had been greatly oppressed. “Forty acres and a mule” was a good idea; alas, they got the Freedmen’s Bureau instead, which (like all government programs) frequently did for them less than advertised and other than desired. However raw a deal they got, though, the generations succeeded each other and each struggled to do better than the one before. And as time went on, reparations made less and less sense. In 2019, we need to ask, Why should those who never held slaves now pay reparations to those who never were slaves? I don’t mean to discount the need to confront ingrained disadvantages. Long after the Normans came to consider themselves English, the original English were still struggling to regain the position they had lost in the conquest. This sort of thing goes on all the time, in all societies, and it can have long-term consequences. But social and economic mobility works in a general way to bring up and cast down, and to say that all African Americans today are the direct victims of slavery is a stretch. It would be more accurate to say that the poor of today – whites as well as blacks (and others) – are the victims of government “help.” Prior to the massive government assistance programs of the 1960s and 1970s, African Americans had made considerable social and economic progress by all the usual statistical measures: household income; unemployment (particularly youth unemployment); level of education; penetration of careers; housing. Despite the continuance of persistent and sometimes vicious racism, they were approaching parity with whites in many ways. Then we set out to overcome the disabilities they labored under. The result has been stagnant income, increased unemployment, poorer educational attainment, deteriorating public housing, and the disintegration of the black family. Many African Americans prospered and made careers, both public and private; but many, many did not. Oh, that’s just conservative myth-making, you say, this idea that the unintended consequences of government assistance actually harms the people it sets out to help. But look at the work of Charles Murray and others. After fifty years of massive federal assistance to the poor, we not only still have the poor, but we have mired others in poverty who had previously not been so dragged down. White income, white educational attainment, white family formation all show the same pathologies previously noted for blacks. The drug epidemics (meth, then opioids) have hollowed out much of rural white America. Where once heroin was considered a street drug only used in the big cities, it is now widely used and easily obtainable in small towns all over the Midwest. Today, the essential division in American society isn’t between the white majority and black/brown/red/yellow minorities; it’s between social classes marked by behaviors (like finishing schooling before getting married and getting married before having children), rather than by color or ethnicity. To note a phrase, “It’s the culture, stupid.” We have damaged our social environment with our well-intended policies, even as we once damaged our natural environment with well-intended policies. We need to pay far more attention to the law of unintended consequences. And as Samuel Alito said, “The way to stop making distinctions based on race is to stop making distinctions based on race.” Reparations is an idea whose time has passed. Having got caught up on my to-do list, and it being a nice day -- and furthermore, having had nine full hours of sleep last night -- I resolved to do a five-mile hike today. I schlepped myself over and around Wapehani and back. I grew up going to Scout camp at Wapehani. We closed the old camp in 1971, and it stood derelict for a few years. The City took it over and made a mountain bike park out of it. They have slowly reshaped the landscape, but the lake was still there. Last time I walked it, a little over a year ago, Daniel and I made a circuit of Lake Weimer. We saw ducks and geese and a bald eagle. But the people who decide such things have breached the dam and re-landscaped the lake bottom into a meadow with lots of little seedling trees. It was desolate. I took my camera along, but saw nothing I wanted a picture of. Alas, to Cuiviénen there is no returning. The rumbles continue through The UMC. Not everybody is on the same page; not even everybody on the same side is on the same page as others of that side. And so the scheming and dreaming goes on. A progressive pastor in my Conference said in an opinion piece that it was time for the progs to move on and form a Progressive Methodist Church where they could finally live out the ethos they feel called to. But the princes of the church are still smarting from their losses and haven’t given up on control yet. Discussion between various bishops and other poo-bahs (Adam Hamilton and Tom Berlin among them) show that they aren’t ready to secede, though that is easily within their grasp. They would like to drive the trads out – or at least, the WCA, which is the most organized body of trads in the church. But they are finally realizing that if the trads stand fast, the progs just don’t have the votes. They can cause chaos, but they can’t legitimize their disobedience. So now they’re talking about negotiating a division. You will remember, I hope, my discussion of the three possibilities for resolving the divide in The UMC: Division; Secession; Withdrawal. If the One Church Plan had prevailed at GC19, the WCA would have led a withdrawal. The Traditional Plan having succeeded, the progressive Conferences have it well within their power to secede. So why don’t they? Well, they may come to that at last, but let us not forget the stakes here. To secede is to leave the bulk of the assets – and, more particularly, the jobs – in the hands of the remainder denomination. The progs want those assets. And they need those jobs. If the progressive conferences secede – even if they refuse to allow the traditional congregations within them to stay with the remainder denomination – there will still be too many bishops and too many clergy for the available positions in the breakaway group. You would have a situation like so many exiled archdukes and countesses and royal pretenders crammed into a tiny court where everyone has a title, but nobody has any power. For those used to swaying the fate of millions (ecclesiastically), this has little appeal. They may despise the trads, but they need lots of them to bulk up the institution and provide places to appoint all the prog clergy who want to follow their call. A similar situation would prevail if it were the other way round, with the trads leaving, with one exception: the traditional congregations are dying slower than the progressive ones. Progressive clergy are, in many cases, like mistletoe on an oak tree, a parasitical growth. Yes, the traditional churches in America are declining, too, but appointing traditional pastors to traditional churches doesn’t hasten their decline; appointing progressive clergy to traditional churches does. But there just aren’t enough progressive congregations around. This means that whenever the secret negotiations are convened, the progressives will first try to gain and hold as much as they can. I expect them to offer the choice of affiliation to conferences, but to limit congregational choice if a church finds itself in an uncongenial environment. And I expect the traditional negotiators, whoever they turn out to be, to turn them down flat. If we’re going to divide, rather than see one group secede, then everybody needs to get a choice: conferences; clergy; congregations. It’s early days yet. My guess is, we won’t see real negotiations and a real deal on the table within reach until next year. Various amendable plans will be filed as petitions to GC20 before the deadline this fall, but until the progs are facing certain defeat at the vote-counting, the hardliners won’t be ready to give up their dream of control and settle for what they can get. So it’s important for the traditionalists to stand firm and continue with the task of pursuing their vision. Work on elections and petitions and keeping the flock together. We should continue to insist on the gracious exit and a no winners/losers outcome, if it can be had; nevertheless, we must be prepared to vote for perfecting GC19’s Traditionalist Plan, with accountability sure to pass the Judicial Council’s review. As I have said over and over, until the progs (especially the bigwigs) are staring defeat in the face, they won’t deal honestly with the issues. And some of them aren’t quite ready to quit fighting, yet. 8:07 pm - How many versions? The last four were all gifts; I must confess my limited ability to use them. I also used to have a Parallel Bible (RSV, KJV, NASB, and Modern Language Bible), a CEV, a Living Bible, and an Amplified NT, but I got rid of them when I last culled my library. The only thing I preach from any more is the RSV (not the NRSV, which I don't think I have a copy of, and don't want). I have occasionally consulted the Latin Vulgate online, but not frequently enough to download a copy. How many different versions of the Bible do you have handy? Before I went into the religion trade I was a student of literature, so I have always approached the Bible, first and foremost, as an old book. Before we can derive deeper or higher meaning from the Scripture, first we have to reckon with it as a text, a book, a thing someone has written. You’d think this would be considered important in preaching and teaching, but I find that the Bible-as-book is often neglected, even among those who most insist upon its authority and integrity. A lot of people – preachers included – treat the Bible as a collection of preaching texts (or even prooftexts). They don’t read each book of the Bible as a coherent whole, let alone the entire Bible as such. For them, it is a collection of meaningful nuggets, each teaching a particular doctrine or telling a particular story that has an application to our lives. This means that while many folks can quote you a great many snippets of Scripture, a far smaller number can tell you what any particular author or book or section in the Bible is trying to get across. Moreover, when we go to a particular sentence or paragraph to back up a doctrinal point over and over, the repeated use of that text acts as a polarizing filter. Instead of that little piece carrying the full meaning of the entire book or section in which it is set, it now only lives as a prooftext for a particular teaching. The context is lost. And after a while, you can let even the particular words of the Scripture go, and just teach the summary derived from it, in which case you are teaching slogans, not Scripture. Far too many people – including preachers – speak in slogans, which may be based in Scripture but nevertheless are not Scripture. And if we never put things in their fuller contexts, we cheat our hearers of the full counsel of the Bible. This need to derive meaning from each nugget leads also to a tendency to put stuff into the Bible which isn’t there. We become obsessed with finding meanings other than the obvious ones. We see connections that aren’t there. We misconstrue words. And we announce hidden meanings to our listeners’ oohs and ahs that are hogwash. Then, of course, there is the oft-repeated call from evangelical pulpits: How many of you brought your Bibles today? Now, having your own Bible – which you actually read – is a very good thing. But we don’t need our Bibles in church if you’re going to project the texts up on the screen. For that matter, unless we all have roughly similar versions of the Bible, you’re going to confuse more people than you enlighten when they try to follow along. This is why many churches have pew Bibles. Now, back when printing was new, the possibility of each person owning a Bible – or at least, each family owning a Bible to read together – was a wonderful, revolutionary thing. But then, there were only one or two versions in English you could buy, so we were all “on the same page,” so to speak, when we read it together. Furthermore, there is little value in owning a Bible if you never actually read it. Bringing a Bible to church is often therefore the employment of a kind of talisman, a totem by which we recognize fellow evangelicals, a tribal marker like a pendant cross or a fish license plate. So, how should we treat the Bible? Well, as a student of literature, I have always taught the Bible as literature. In all the Bible studies I led my aim was content mastery. As we went through a particular book, I would point out things like the author, and what the author’s point of view was. I would bring in background information to help make sense of the text, like historical connections and customs of the time. When difficult words – or even more important, key words that are more difficult than they appear to be – came along, we would disentangle the meaning. At the same time, I would be asking questions about how this applies to people today, trying to get them to put themselves into the text and then putting the text into their lives. But without the background, trying to wring something edifying out of the words is just chasing rabbits. People are often surprised to find that the Bible can be read just as an old book. They thought there would be all kinds of mystical truths and prophetic puzzles and whatnot in it. Well, yes, there are some of those things, too. But a lot of the Bible is plain narrative – or even plain doctrine – presented in ordinary language for ordinary people. It ought to be readable. The leader’s job is to assist the readers in about the same way that a teacher would help you read a Shakespeare play or a speech by Abraham Lincoln or a long poem like The Waste Land. Now, it matters that the person so teaching the Bible is a person of faith, who believes in the Christ of the Bible. But so long as the teacher is honest and doesn’t neglect matters of faith and obedience, teaching the Bible is still teaching people to read an old book in order to know what’s in it. Treating the Bible as an old book has an interesting benefit: it avoids the pitfalls of both Liberal and Evangelical criticism. Liberal biblical criticism was born in 19th Century Germany, in a desire to free the Bible from the dead hand of Protestant pastors, who pronounced, “the Bible says” over every issue. Liberal criticism claims to be only scholarly, but it assumes, a priori, that the supernatural does not exist – or if it does, it never does a miracle. It explains the Bible in order to explain it away. In response, Evangelical criticism evolved the idea of “Biblical inerrancy” in order to defend the Scriptures. But such a critical approach merely assumes, a priori, a set of facts not in evidence. In effect, the Liberals set up a test the Bible was sure to fail, so the Evangelicals set up a test the Bible was guaranteed to pass. Neither can go anywhere else from there; you pays your money and you takes your choice. But if the Bible is approached, first and foremost, as just an old book, then we have to play fair with it. No gimmicks! We apply to the study of the Bible the same critical apparatus we would apply to Beowulf or Caesar’s Commentaries or Herodotus, and nothing else. We make no assumptions, we grind no axes. And then, we find God speaking to us out of the contents of the Bible. Egad. Before we even begin to understand the NT cultural background, we need to understand that "dinner napkin" is a comparatively late meaning of "napkin." Nap- is an element meaning a piece of cloth, and -kin is a diminutive, so "napkin" means "small piece of cloth." That can mean dinner napkin, of course, although in Australia they call such things a "serviette," while "napkin" is reserved for feminine hygiene products. In the same way, "nappy" (a diaper) is an alternate form. Middle English "a napron" saw the N move to the article and become "an apron" -- a piece of cloth worn over the outside of one's clothing to protect it. So, your story doesn't even construe itself properly in English. This is not a dinner napkin we're talking about. People were not ever buried with dinner napkins. There is no such ancient Jewish tradition. In Greek, it was a soudarion, meaning "face cloth." Think handkerchief, bandana, headband, do-rag. It was also used to bind up the jaws of a corpse in its shroud -- a use that continued until the 19th century, when morticians began to use needle and sinew to sew the dead's mouths shut for viewing. The Ghost of Jacob Marley is wearing such a cloth around his face in Dickens' "A Christmas Carol." In John's Gospel, the note that the face cloth was found rolled up (not neatly folded) by itself probably refers to its falling away from the body of Christ when his shroud crumpled into itself upon his resurrection. Please, please, please, stop sharing this bilge. I suppose it's unfair to the person sharing the story, who didn't know any better and just thought it was cool. But folks: we orthodox interpreters of Scripture complain endlessly about the progressives changing the meaning of the text or picking and choosing what to believe. We say, we must stick with the Bible! Bible!Bible!Bible! And then we post stuff like this, which outrages the text. We ignore the actual meaning, which we could learn from any good Bible commentary. We not only sail right by learning about ancient cultures, we outright invent ancient Jewish traditions. All of it, based upon a misconstruing of an English word. How can we say we want the Bible taught, in all its integrity, when we so violate that integrity by the crap we flat make up? I am ashamed to say, a lot of us just don't care what the Bible actually says, we just want our fancies given authority to overrule other people's fancies. God help us. The UMC is now in discussions on who gets custody of the children and who gets saddled with the mortgage. So to speak. In a recent post, I said that the UMC is faced with three options: Division; Secession; Withdrawal. It now appears that the most prominent progressives are going for the Secession option. They intend to leave and form something like a Progressive United Methodist Church. The traditionalists are willing to help them do this. Those who offered a gracious exit to anyone are following through on their offer to those who fought the idea of a gracious exit tooth and nail but who now could use it. In any case, it looks like the traditionalists may "inherit the denomination," as a friend put it to me recently. I presume the Western Jurisdiction and other progressive Annual Conferences will secede to form the core of a new denomination. In such a case, there will be clergy and congregations in those progressive conferences who will not want to make the move with them. At the same time, there will be clergy and congregations in conferences who stay with the denomination who would like to be part of a Progressive UMC. GC20 should facilitate this. No one should be stuck in a hostile denominational structure. But supposing that works out, graciously or not, what do those of us left with the denominational name and structures do then? In any case where some leave but some stay, the purists are those who leave; the remainers are somewhat of a mixed bag. Giving a gracious exit to anyone who wants it will help sort people into the groups they desire to be part of, but still, there will be more variation among clergy and congregations in the shrunken remainder than in the exiting pioneers. The reason for this is simple: leaving is hard. Some will not leave simply because they are used to what they know. Others will not leave because the jobs are here, not there. Some are simply averse to making decisions. In particular, there will be a large number of clergy in the remainder denomination of mixed opinions and proclivities. Whoever gets the house will get the children; that is, the remainder denomination will have an inordinate share of the bishops and clergy, even if their like-minded congregations have mostly gone the other way. And this would be true even if conditions were reversed, and the trads were the ones leaving, rather than the progs. If it's the progressives who leave, then we who remain will have to deal with some serious leadership issues. We as a denomination have chosen to adhere to our historic, orthodox understanding of sexuality. But we are likely to be led by a majority of bishops who worked very hard to undermine that understanding and to pass the One Church Plan. Likewise, there will still probably be a lot of BOOM members, Conference staff, and Superintendents in the remainder conferences who are not traditionalist-minded. These BOOM members have put many obstacles in the way of ordaining and deploying orthodox clergy candidates. Staffs and Superintendents have not always seen the value in their traditionalist constituents. And we will be saddled with a lot of general agencies and seminaries we can neither afford nor control, stuffed with progressives who have defied or slow-walked the will of General Conference. First thing to do then is, we need to retire a bunch of bishops. The greater part of them have sacrificed their integrity and spent all their leadership chips to take us where we would not go. They cannot lead us now. Pension them off and elect new ones. Next, we need to address ourselves to the BOOMs and Staffs and Cabinets. Bishops need to be reminded that GC has set the direction for the UMC, and we need leadership that reflects that direction. That doesn't mean we institute a purge, still less a witch hunt. We're not about making everybody think alike. We are about obeying the rules. And defending the goodness of those rules. Third, we need to cut the general agencies and seminaries loose. Some of them, like Wespath and the Publishing House, and the Upper Room, offer stuff that other people want, and can function independently. They can resource us (and the new ProgUMC); some of them resource other denominations even now. We might keep relationships with some others. But a lot of the general agencies provide little that we need right now. And most of the official UM seminaries produce graduates who don't fit with where we want to go. Let them do what they do, without further denominational support, and we will judge candidates from their schools on a case-by-case basis. All this is just clearing the decks so we can get the ship back on course. Once we get this ugly fight past us, we need to start thinking about making disciples again. We need to get back to the Main Thing again, with fewer distractions. One of the challenges we will face is to effectively support the Central Conferences, even as the US portion of the church is significantly reduced. To get back to making healthy congregations and conferences with a future in both the US and overseas is a tall order. Therfor Y boundun for the Lord biseche you, that ye walke worthili in the clepyng, in which ye ben clepid, with al mekenesse and myldenesse, with pacience supportinge ech other in charite, bisi to kepe vnyte of spirit in the boond of pees. O bodi and o spirit, as ye ben clepid in oon hope of youre cleping; o Lord, o feith, o baptym, o God and fadir of alle, which is aboue alle men, and bi alle thingis, and in vs alle. The "o" there is obviously the way Wycliffe said "one." One body, one spirit, one Lord, one faith, one baptism. But then, in that same section, we read "oon hope." In ME, the double vowel is a long vowel (in duration, especially), so "oon" means "one," but would be pronounced as a homonym for "own," rather than "won." So, why the difference? Is "o" all those times just an abbreviation for "oon?" Or is "oon" there because Wycliffe wouldn't normally pronounced the aitch in "hope?" This would correspond with ME usage of "a/an" and "my/mine." Wycliffe writes "eritage" for "heritage." If he were writing for the ear, then this tells us that he didn't pronounce the aitch, didn't even think to put it on there as a silent aitch. Perhaps that's because it would be unaccented in this line? Appalachian dialects preserve some quirks that descend from ME. They say "hit" for "it" -- but only in accented syllables. "Hit's amazing" will be followed by "I've never seen it before." Something like that may be going on in Wycliffe's dialect. I enjoy reading the Bible in different languages and dialects. You'd think I'd like The Message. Unfortunately, paraphrases tend to obscure meaning, rather than illuminate it. You see, a sentence doesn't just mean one thing; it has echoes and allusions and uses words that have been used before. It fits together with other things you already know. But a paraphrase, with its strain to be original, or contemporary, is like a polarizing filter. It reduces the range of meaning to the one that seemed most important to the person making the paraphrase. Reading actual translations in different languages and dialects, though, brings out more of the meaning. For instance, I like to read in John Wycliffe's Middle English Bible. And I was just dipping into it and found myself in Ezekiel Chapter 9, where I read of a vision of judgment. I was startled to read of the man clothed in linen clothes with a writing instrument sent out to mark the foreheads of those who wailed and sorrowed over the abominations done in the city. He was to mark them with a Taw. That doesn't show up in the RSV I usually read. There, it says, merely, "put a mark on the foreheads of the men who sigh and groan over all the abominations . . ." (The Message says the same, "put a mark.") I don't have a Hebrew Bible or even a Septuagint; but in any case, Wycliffe would have been translating from the Latin Vulgate, which reads, "et signa thau super frontes virorum . . ."
Here's the deal: Taw is cognate with Greek Tau, which we would call the letter T. Unlike in the Greek and Roman alphabets, though, Taw is the last letter of the Hebrew alphabet. It stands for endings, like Greek Omega or Roman Z. It particularly stands for the end of all things -- death and the judgment -- and the hope that lies on the other side of death and the judgment. It became, in fact, a symbol of the hope of resurrection. In Ezekiel's day and for many centuries thereafter, the Taw was written not as a Greek Tau, as an upright cross, but as a sideways cross, like we would make an X. This X, which stands for the last things and the resurrection beyond them, is a frequent symbol of "That Day," and was commonly used to mark Jewish graves. To be marked by the Taw is thus about more than just moral judgment. The people so marked are not merely the good people left who are shocked by the immorality of others. The people marked with a Taw are those who will be saved out of the judgment, those who belong to God and who keep the hope of his deliverance -- not only temporally, but eternally. When we place ashes on the forehead on Ash Wednesday, and when we anoint the forehead with oil in confirmation (those of us that do that), we mark with a cross -- Taw -- those who come repenting of their sins, those who are surrendering their lives to the crucified Savior who is the Resurrection and the Life. Anyway, I find it interesting that to get the full flavor of that, I found a clearer translation in Wycliffe's Middle English than in the RSV. I took Her Majesty to the vet today for her annual checkup. She did fine. After I took her home, I threw some things in a duffel and headed for Wilderstead to do some chores. 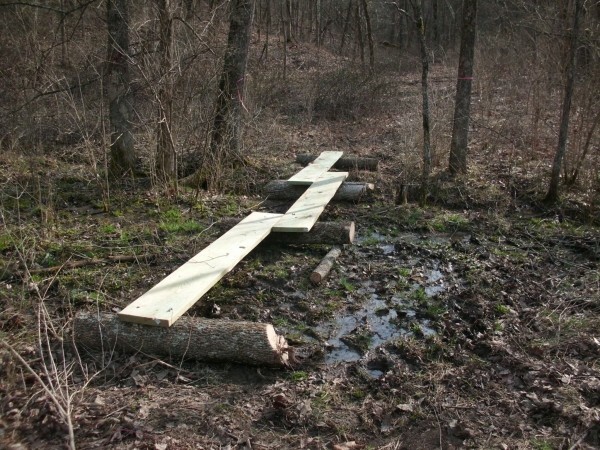 The first thing I tackled was replacing a plank bridge that was rotting through. A new springlet has opened up and turned the area next to the stream wet, so it would take three planks instead of one. And like a fool, I bought 2x12s to do it, thinking that was what I had out there (it was a 2x10). Heavy -- and expensive. But I got 'er done. Pounding spikes into fresh-cut ash logs will wear you out, by the way. I also attended to some erosion problems with various bits of wood. I dug out and backfilled more dirt from the undercroft. Very tiring. Finally, I had cleaned out my water tank and brought out 25 gallons of water for my cabin now that the hard freezes are over with. I had to cut a new spar for my tripod, then lashed it together and attached my block and tackle. With that, I was ready to pull the water tank out of my truck bed and hoist it into place. 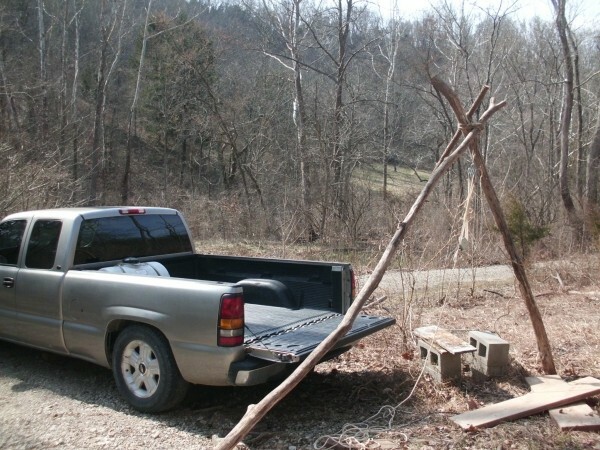 Just as I began to swing the tank out of the truck bed, however, the old rope truss that I tied in place several seasons ago broke, and the whole thing hit the ground and rolled downhill a bit. It lay there like a big, ol' plastic pig, all 200+ lb. of it. So, I scrounged up some old heavy cloth rope and rocked the tank back and forth so as to get the rope underneath it, and made a new truss for it. 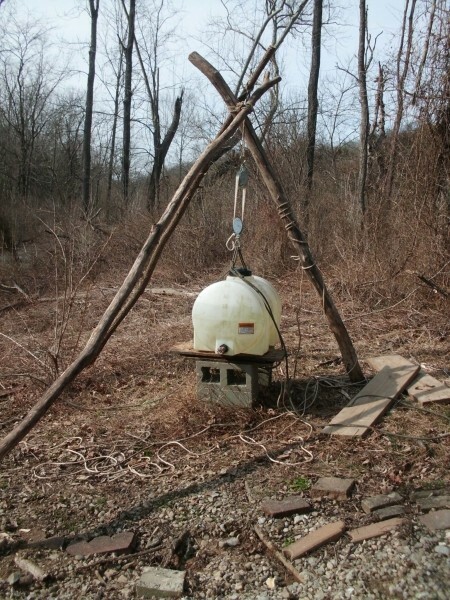 Then I attached the block and tackle and bit by bit pulled the tank uphill, repositioning the tackle twice. Finally, I hoisted it into place. I was exhausted when I finally got the job done. As I was disassembling the tripod, I reflected on all the Scouts who gripe about having to learn knots and lashings they think they'll never use. I use my Scoutcraft skills all the time, at home and in the holler. Shoot, I used them around the church as a pastor constantly. Normally, I go over to Wilderstead early and leave in mid-afternoon. It was nearly 6:30 when I finally pulled out of the gate and headed for home again. Still waiting on my excavator neighbor to come fix my road, fix my creek, and install my back wall perimeter drain. He said the second half of March; God speed the work. Meanwhile, I'm hoping I can get a friend out to ready my electric hookup so REMC can place a pole for me this spring. 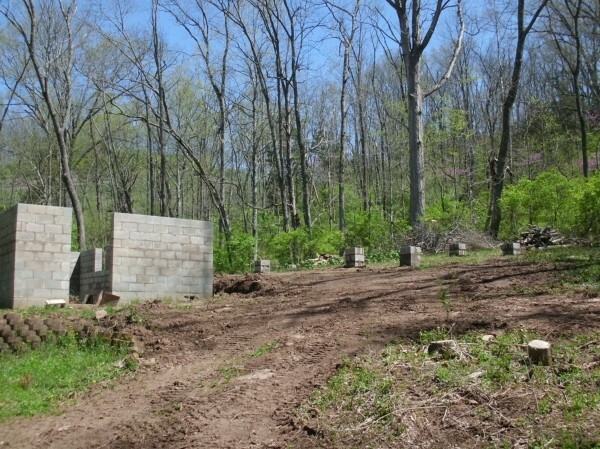 April will find me finishing the concrete block piers. Then comes the sill plate. Round about the 1st of May, I hope to start banging nails. With a nail gun; the days when I could contemplate building a whole house with just my trusty framing hammer are long gone, I'm afraid.